Lee Friedlander's surreal sensibility is on full display in this set of photographs, originally published in 1970. Here Friedlander focuses on how his physical presence impacts his photographs. Known for capturing subjects outside of himself--nudes, landscapes--Friedlander writes: "At first, my presence in my photos was fascinating and disturbing. But as time passed and I was more a part of other ideas in my photos, I was able to add a giggle to those feelings." Readers can witness this progression through the images here as Friedlander appears in shadow, reflected in windows and mirrors, and, only occasionally, fully visible through his own camera. In some photos he visibly struggles with the notion of self-portraiture, desultorily shooting himself in household mirrors and other reflective surfaces. Soon, though, he begins to toy with the pictures, almost teasingly inserting his shadow into them to amusing and provocative effect--elongated and trailing a group of women seen only from the knees down; cast and bent over a chair as if seated in it; mirroring the silhouette of someone walking down the street ahead of him; or falling on the desert ground, a large bush standing in for hair. These uncanny self-portraits evoke a surprisingly full landscape of the artist's life and mind. There are nearly 50 duotone images in this reprint edition of Lee Friedlander: Self Portrait, which includes a new essay about the work by writer John Szarkowski. Lee Friedlander's surreal sensibility is on full display in this set of photographs, originally published in 1970. Here Friedlander focuses on the role of his own physical presence in his images. He writes: "At first, my presence in my photos was fascinating and disturbing. But as time passed and I was more a part of other ideas in my photos, I was able to add a giggle to those feelings." Here readers can witness this progression as Friedlander appears in the form of his shadow, or reflected in windows and mirrors, and only occasionally fully visible through his own camera. In some photos he visibly struggles with the notion of self-portraiture, desultorily shooting himself in household mirrors and other reflective surfaces. Soon, though, he begins to toy with the pictures, almost teasingly inserting his shadow into them to amusing and provocative effect--elongated and trailing a group of women seen only from the knees down; cast and bent over a chair as if seated in it; mirroring the silhouette of someone walking down the street ahead of him; or falling on the desert ground, a large bush standing in for hair. These uncanny self-portraits evoke a surprisingly full landscape of the artist's life and mind. 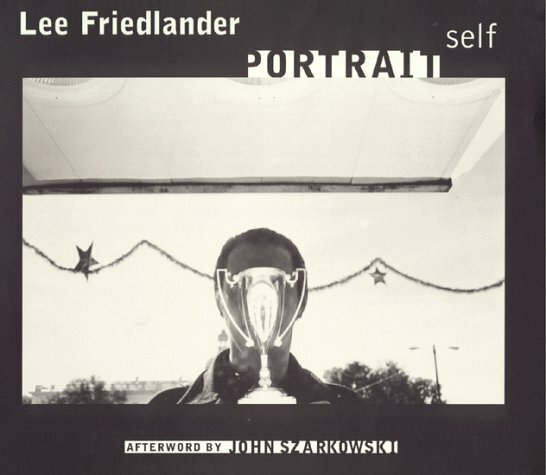 This reprint edition of Lee Friedlander: Self Portrait contains nearly 50 duotone images and an afterword by John Szarkowski, former Director of the Department of Photography at The Museum of Modern Art.